We’re looking to find the best games room that the UK has to offer this year in the Games Room of the Year competition. The closing date for entries is Friday 18th September at midnight, so there are only a few days left to enter and be in with the chance of winning £3000 cash. We’ve seen some of the greatest games rooms over the years, especially when our customers have sent us in pictures of where our products end up! We’ve seen kitchen diners turned into a fun place for the whole family with a pool table or a shuffleboard, basements kitted out with a football table and footy memorabilia, spare rooms transformed into arcades, log cabins converted into retro bars with classic pinball machines and even garages turned into man caves with a cinema and surround sound systems. We’d like to shine a spotlight on the hidden treasure troves that you have in your homes. This competition isn’t about who has the biggest games room or the amount of equipment that you have in there, it’s about the creativity, unique approaches and passion behind the design of your games room. We’re looking for a games enthusiast that has a real love for their games room and the collection inside it. We’ve had some great entries so far, including log cabins, pinball and arcade rooms and party spaces complete with home bars. But we’re looking for more entries in the last week of the competition! This log cabin entry is from Desmond in Hampshire, each log for the build was cut and placed by hand, making it a lengthy project but it was definitely worth the wait. It’s fully kitted out with a great range of games to make the space a fantastic leisure place to spend time with family and friends. His games room has a table tennis table, an air hockey table, pool table, American dining booths and much more. Having somewhere to eat whilst you relax is definitely a bonus for us. Here’s another great entry from Cristian in London. The main piece in his room is the stunning Montfort Capelan American pool table which he purchased from us at Home Leisure Direct. He also has a 5 seater electric recliner couch, Sony 65" 4k Ultra HD TV paired with a Sony sound bar, XBOX One, Playstation 4 and a Wii U. You can be sure that Cristian’s family and friends will never get bored when they visit. This entry is from Jack in Portsmouth. 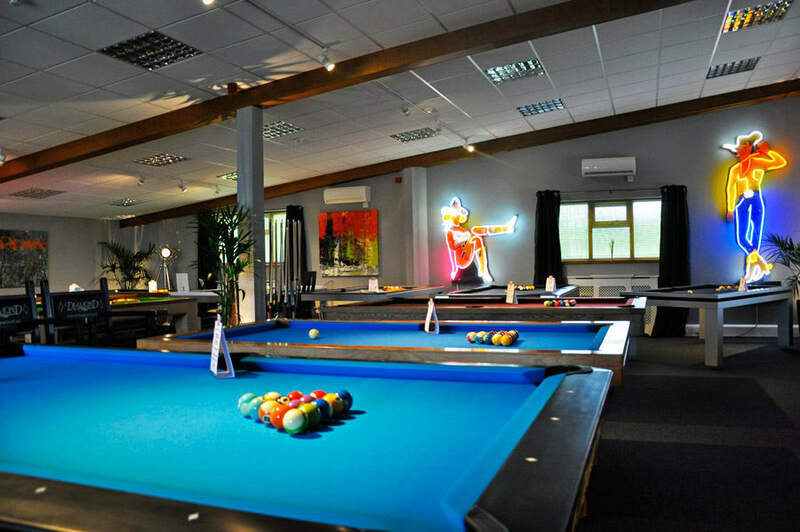 His games room is complete with a pool table, home bar, darts board and other great activities for parties. He is a builder, so he completed all of the work to make sure his space turned out exactly how he wanted it to. He enjoys finding and adding new pieces to his games room to make it the best it can be. Damon from Oxfordshire has maximised space in his games room to make it the perfect place to spend an evening with his mates. Inside the games room is an air hockey table which he bought from us at Home Leisure Direct, an Attack from Mars pinball machine, two TVs, gaming consoles and of course a beer fridge - what else does a man need? Craig describes his games room as the “heart and the soul” of the house. They decided to make an area for the whole family due to their eldest child always being in his bedroom! Needless to say they all enjoy spending time in this room. Their pool table also doubles up as a dining table so that the whole family can eat dinner together. Tony from North Yorkshire also entered our competition with a retro style games room that the whole family can enjoy. They have a bar, retro number plate decor, a Supreme Pool Table which was purchased from us at Home Leisure Direct, a 1988 Jukebox and even a popcorn machine! This room is truly built for entertainment. Another great entry we’ve had is from Adam in Crawley who converted his garage into a games room to feed his passion for pinball that he’s had since a child. He’s put a lot of care and attention into restoring these classic machines himself to bring them back to their own full glory. Inside the room is a coca-cola diner, five classic pinballs, retro artwork, neon signs and a black mirror effect ceiling which reflects the lights of all the pinballs. These are just a few examples of some of the stunning entries that we’ve had so far, but we’re still looking for more games rooms for this competition. All you have to do is complete our simple submission form which includes photos of your games room and tell us why you think your games room is a worthy winner in up to 100 words. You can even add a video of your games room if you wish. You can follow the competition and check out our other entrants on our Facebook and Twitter pages during the next few months. Initially you’ll be up against regional competition, at this point your entry will be looked at by an internal judging panel at Home Leisure Direct. One winner from each region will go through to the finals for the public vote to decide the winner of the competition. Regional winners can get their family and friends to vote for their games room as well as attract supporters from the area to vote for the finalist in their region. The amazing £3000 cash prize can be spent on whatever you like, from new additions to your games room such as a new pinball machine or pool table, to a holiday abroad with your family or friends - it’s yours to spend however you see fit. The closing date for this great competition is Friday 18th September this year, so you better get entering! Good luck, we look forward to having a look at all of your games rooms entries!